FUTURE TECH: The winning FatigueHACK team at TA2108 in Canberra, Augmented Intelligence. THE TRANSPORT industry is undergoing an intense period of change, with several 'big issues' rapidly becoming more prominent in everyday conversations. The upcoming review of the Heavy Vehicle National Law (HVNL) is one example, and it's sparked calls for industry-wide transformation. The need for better fatigue management and rest stop facilities for drivers have also generated debate, creating a challenge for the industry to rethink its current legislation and practices. In this time of change, we need disruptive thinking more than ever. Together, we must work towards improving safety for everyone on the roads and protect the future of the transport industry. Tackling these issues head on will continue to move the transport industry forward, and frank conversations are required to move as a unified front. This week's Trucking Australia event in Perth is the perfect opportunity to kick off these discussions. Over a 20-year period between 2011 and 2031, Australia's national freight task is projected to increase by 75 per cent in response to online shopping and retail trends, as well as increasing globalisation of business. This means more drivers on the roads, and a greater need for improved safety. Effective fatigue management, better rest stops, accessible technology and more proactive legislation are some of the changes required to ensure Australia's fatality rate continues to trend downwards. Collaboration between all parties in the transport industry is key to implementing real, lasting change, and forums such as Trucking Australia provide a collective platform for the kind of disruptive thinking we need. For example, a core focus this year is rest stops, and how they can be designed to better reflect the needs of drivers. Currently, rest stops are inadequate for truck drivers, and there are calls for new standards. These stops are visited by hundreds of people daily, and even thousands over long weekends, yet very few accommodate the needs of long haul drivers. Often, they're far too short for longer heavy vehicles, and space can be taken up by just about anyone, including roadside vendors who block access for truckies who genuinely need to rest and recover. Austroads recently updated its guidelines for safe heavy vehicle rest stops, and while this is a great start, we need the voices of everyone working across the transport industry, including truck drivers, fleet managers, local government and regulators, to create an effective and worthwhile solution. Similarly, reforms to the HVNL will only come about through extensive community consultation and discussion. Trucking Australia is taking place in Western Australia this year, one of the few states that has not signed onto the national legislation. With the opportunity to hear from a range of voices, we can create a unified approach that addresses the need for stronger safety standards and streamlined, easy to follow regulations. In the case of fatigue, we're already seeing the effects of this collaborative effort. 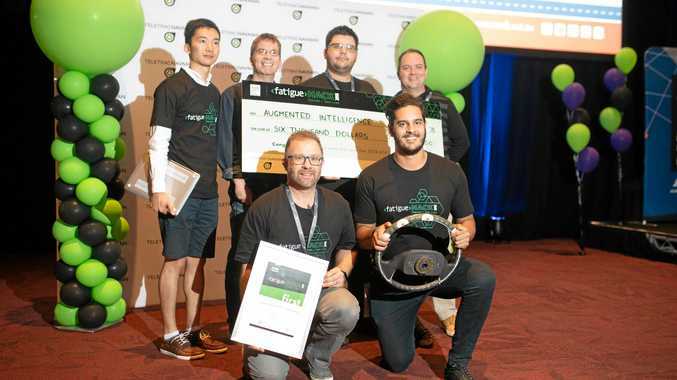 Last year's Trucking Australia program introduced FatigueHACK, a 2-day hackathon that aimed to identify new solutions for driver fatigue management, particularly during long haul trips. The winning team, Augmented Intelligence, created an electrocardiogram-powered 'smart' steering wheel that monitored driver heart rate and symptoms of fatigue. With input and guidance from drivers, fleet managers, medical practitioners and business leaders, Augmented Intelligence was able to build a practical, working solution. And with the steering wheel already in testing phases, it might just change the future of trucking. This year, trucks from Pilbara Heavy Haulage and Kendall Trucking will be retrofitted with the solution and driven down to the show to put the technology into practice. Augmented Intelligence will also be part of a panel, along with fellow FatigueHACK finalists GlobalWhere and Teletrac Navman, to discuss the progress they've made. Implementing change in the transport industry will have a long-lasting, Australia-wide impact for all road users. This is why we need to start the conversation now, to generate ideas that will drive everyone in the industry forward. As the saying goes, 'without trucks, Australia stops', and that is truer than ever before. Collaborative solutions will create a safer road for everyone and effectively secure our trucking future. Collaboration is key to unlocking the future of our transport industry. About the authors: Andrew Rossington is Vice President - Transport Solutions, Teletrac Navman and Ben Maguire, Chief Executive Officer, Australian Trucking Association. They will be be appearing at TA19 in Perth from April 3-5.